Letter to H.E. Mr. Traian Basecu, President of ROMANIA. Letter to H.E. Mr. ANDRIS BERZINS, President of the Republic of Latvia. Letter to H. E. Mr. PAUL BIYA, President of the Republic of Cameroon. Letter to H.E. Mr. FIDEL Valdez RAMOS, Former President of the Republic of the Philippines. Letter to H.H. Sheikh SABAH AL-AHMAD AL-JABER AL-SABAH, EMIR of the State of KUWAIT. Letter to H.E. Mr. ALEXANDER LUKASHENKO, President of the Republic of BELARUS. Letter to H.H. NAWAF AL-AHMAD AL-JABER AL-SABAH Crown Prince of the State of KUWAIT. Letter to H.E. Mr. MAHINDA RAJAPAKSA, President of the Democratic Socialist Republic of Sri​ lanka. Letter to H.M. MOHAMMED VI, King of Morocco. Letter to H.E. Mr. OLLANTA HUMALA TASSO, President of the Republic of PERU. Letter to H.E. Mr. MLADEN IVANIC, Chaiman of the Presidency of Bosnia and Herzegovina. 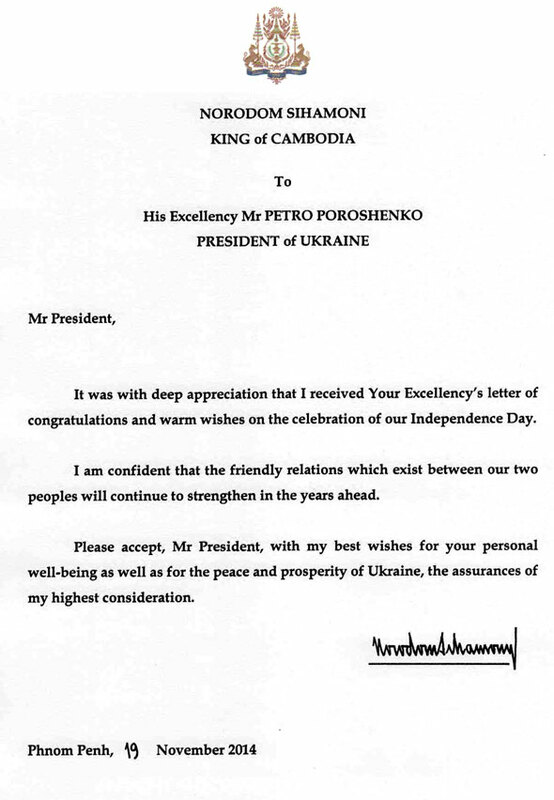 Letter to H. E. Mr. NURSULTAN NAZARBAYEV, President of the Republic of KAZAKHSTAN. Letter to the Right Honorable Dr. RAM BARAN YADAV, President of the FEDERAL DEMOCRATIC Republic of NEPAL. Letter to H.E. Mr. HEINZ FISCHER, Federal President of the Republic of Austria. Letter to H.E. Mr. JÁNOS ÁDER, President of the Republic of Hungary. Letter to H.E. Mr. TSAKHIA ELBEGDORJ, President of MONGOLIA. Letter to H.E. Mr. PETRO POROSHENKO, President of Ukraine. Letter to H.M. Sultan HAJI HASSANAL BOLKIAH of Brunei. Letter to H.E. Mr. FRANÇOIS HOLLANDE, President of the French Republic . Letter to H.E. Mr. U THEIN SEIN, President of the Republic of the Union of Myanmar. Letter to H.E. Mr. BAN KI-MOON, Secretary General of the United Nation. Letter to H.E. Mr. TRUONG TAN SANG, President of the Socialist Republic of Vietnam. Letter to H.E. Mr. ENRIQUE PENA NIETO, President of the UNITED MEXICAN STATES. Letter to H.E. Mr. MAHMOUD ABBAS, President of the State of Palestine Chairman of the Executive Committee of the Palestine Liberation Organization. Letter to H.M. ABDULLAH BIN ABDULAZIZ SAUD, King of the Kingdom of SAUDI ARABIA. Letter to H.R.H. the CROWN PRINCE SALMAN BIN ABDUL AZIZ AL SAUD , Deputy Prime Minister and Minister of Defense of the Kingdom of SAUDI ARABIA. Letter to H.E. Mr. MILOŠ ZEMAN, President of the Czech Republic. Letter to H.E. Mr. MAHMOUD ABBAS, President of the State of Palestine, Chairman of the Executive Committee of the Palestine Liberation Organization. Letter to H.E. Mr. MAMNOON HUSSAIN, President of the Islamic Republic of Pakistan. Letter to H.E. Dr. TONY TAN KENG YAM, President of the Republic of Singapore. Letter to H. E. Mr. DIDIER DURKHALTER, President of the Swiss Confederation. Letter to H.E. Mr. BARACK OBAMA, President of the United States of America. Letter to H.E. Mr. ABDELAZIZ BOUTEFLIKA, President of the People democratic Republic of Algeria. Letter to H.E. General the Honorable Sir PETER COSGROVE AK MK (retd), Governor-General of the Commonwealth of Australia. Letter to H.E. Mr. PRANAB MUKHERJEE, President of the Republic of India. Letter to H.E. Ms. PARK GEUN-HYE, President of the Republic of Korea. Letter to H.E. Mr. BENIGNO S. AQUINO III, President of the Republic of the Philippines. Letter to His Majesty CARL GUSTAF, King of Sweden. Letter to H.E. Mr. NGUYEN PHU TRONG, Secretary General of the Central Committee of the Communist Party of Vietnam. Letter to H.E. Mr. TRUONG TAN SANG President of the Socialist Republic of Vietnam. Letter to H.E. Mr. JOACHIM GAUCK, President of the Federal Republic of Germany. Letter to H.M. AKIHITO, Emperor of Japan. Letter to H.E. Mr. RAUL CASTRO RUZ President of Council of State and of council of Ministers of the Republic of CUBA.